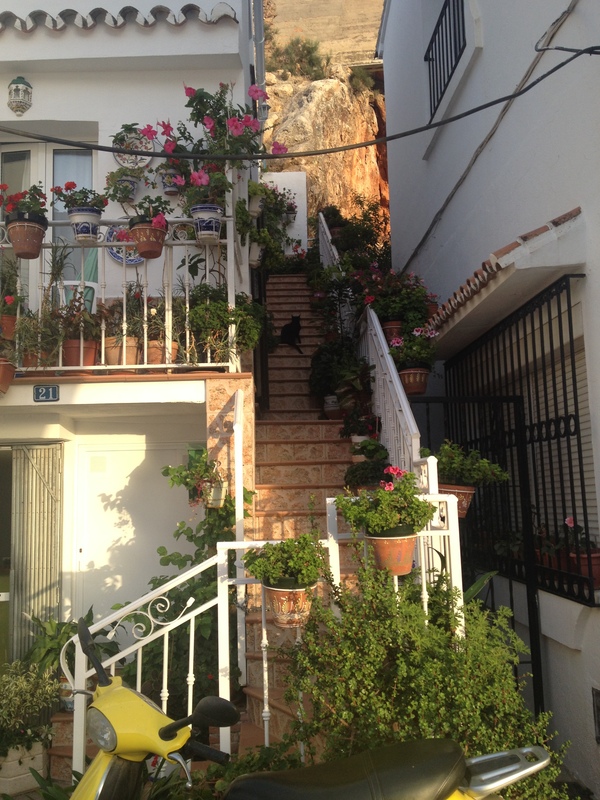 I haven’t previously mentioned that I am in Mijas Pueblo, Spain without a car. Today I am going to talk about that. You may think that basic transportation is an essential component of living. I think it comes from our American spirit of “on the go” independence. Having a car is expensive here so my primary mode of getting around the village is “self-propelled,” meaning “on foot!” Why would I need to have a car when everything I really need is a walk away? Yes, sometimes that walk may take awhile but that is good time to look at the surroundings, greet people, take photos, and contemplate. The baker, market, butcher and eating places are all at a very reasonable walking distance which, at the most, is twenty minutes. 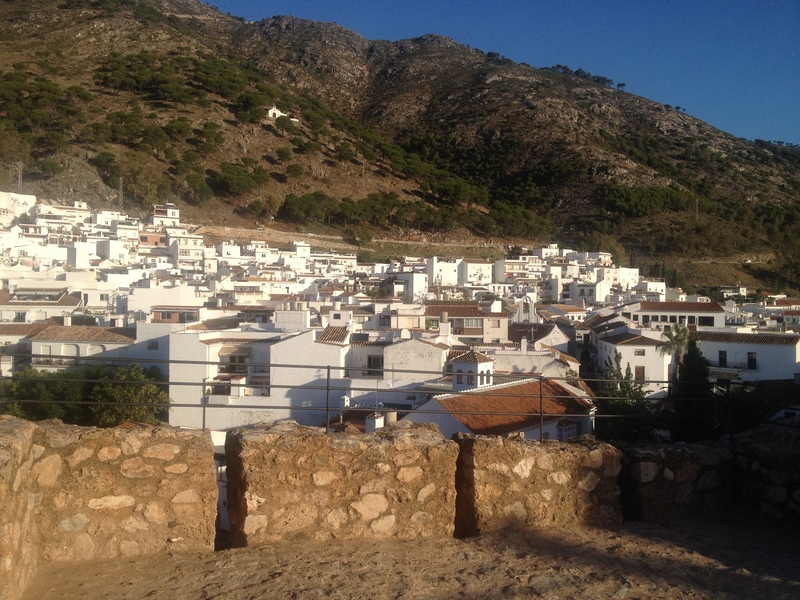 I enjoy the walks exploring the pueblo and the exercise going up and down all of the hills and steps is good for me! This morning I broke my usual routine and I ate breakfast in. I walked to the local bakery nearest to me and bought a small loaf of warm, fresh bread. I don’t know about you, but warm, fresh-baked bread really arouses my senses! The smell of fresh-baked bread fills the morning air and the thoughts of fresh bread makes my mouth water in anticipation of loading a chunk of it with delicious blueberry jam! I also think it feels different when you eat it! Anyway, on my way back from the bakery I found a man selling churros (a cousin to funnel cake). I bought three for one Euro to add to my breakfast of fresh bread and jam. I ate this morning on my sunny balcony with a warm breeze coming off the Mediterranean Sea! Life is good! I briefly mentioned exercise. 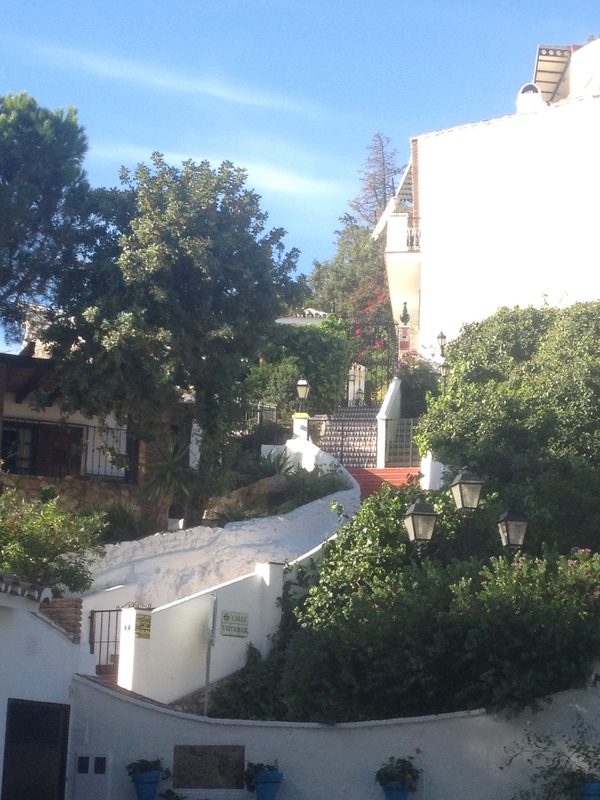 I have only hiked a short distance up the mountains behind me (to the little white chapel in the photo above). 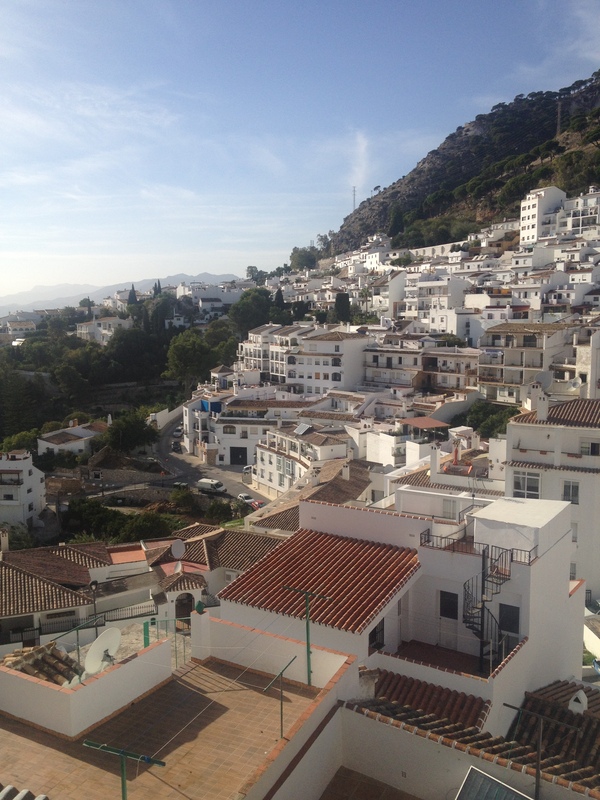 Mijas Pueblo is at about 450 meters (1475 feet) above the sea on the side of a mountain in the Sierra de Mijas range. The mountain goes up to about 3600 feet and I estimate that I have been to an elevation around 1900 feet. Thanks for reading the blog! It is lots of fun reflecting on the village and people! Previous Previous post: Old People Out-and-About!